Online delivery of and access to TV services are now mainstream activities, and those involved in TV distribution are keen to ensure quality of experience for their audiences as well as achieve operational efficiencies. In the coming years, delivery to unmanaged devices will become the most common form of online TV distribution. The market for long-form OTT video services – currently dominated by the global SVOD giants – will expand to include greater presence of local and national players. Along with these developments comes a growing need for TV providers to keep control of their services by delivering more local traffic via their own CDNs – as well as stepping up the protection of content against online piracy. 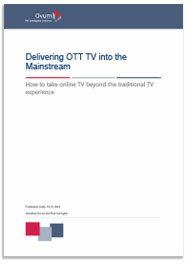 This white paper, produced by Ovum on behalf of Edgeware, highlights the opportunities and challenges for traditional broadcasters and pay-TV operators in adapting to their rapidly evolving environment. Thank you for your interest in our products. We have emailed the Analyst Whitepaper to you, but you can also download it directly using the button below.